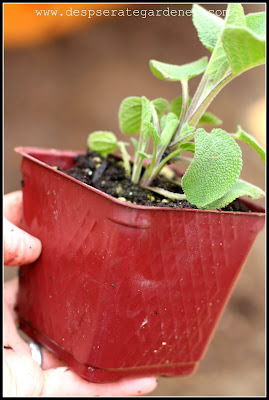 Continuing on with my easy container gardening week! You have picked out your containers and found a suitable location for them. Next, it's time to go to the store to buy soil and your herb and vegetable starts. 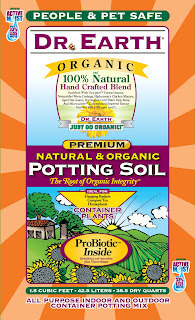 Purchase a small bag of organic mulch. Mulch is important for maintaining soil temperature, conserving moisture, and keeping pests away. You will be adding about one inch of mulch around the base of your plant. This really does make a difference, so don't skip this step! Pick the healthiest looking starts (duh).You can buy duds, and you most likely will blame yourself for killing the plant when really it was not your fault! Look for dark green leaves. Short and stout is a sign of a healthy plant. Do not buy starts that have flowers or buds! Starts should be too young to have buds or flowers, and are most likely stressed if they are already blooming. Feel the plants leaves and pick the ones that feel a bit weathered. Especially with basil, if leaves feel like tissue paper, it probably isn't hardened off, and will most likely not do well. Now we have the basics down, tomorrow we are on to the fun stuff. 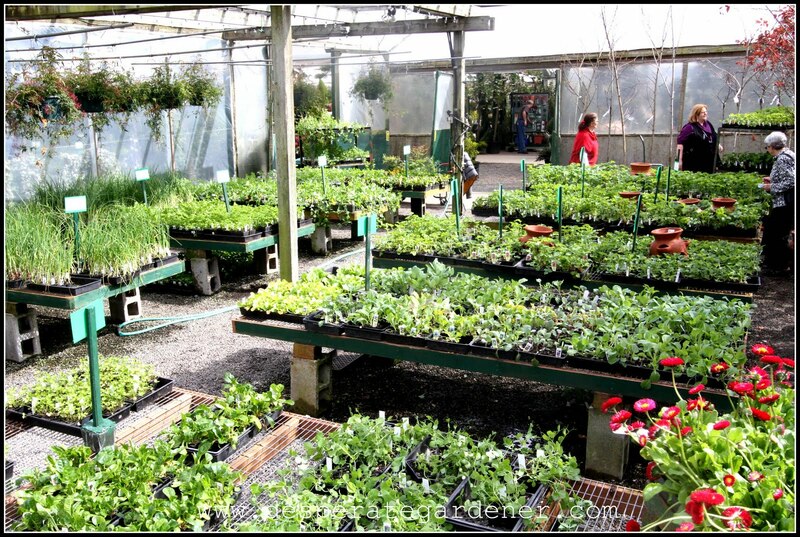 I'll be discussing different varieties of herbs and vegetables that you can grow together! Tomato Tuesday: When to harvest! 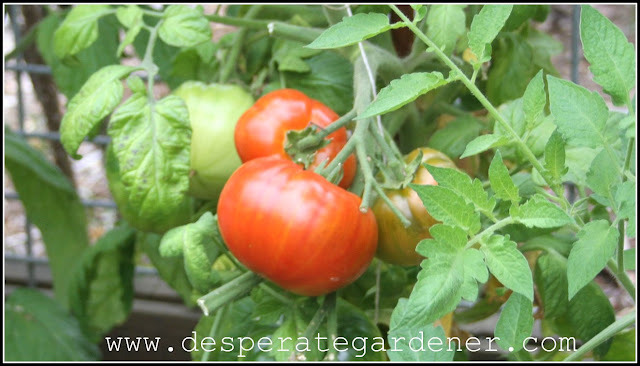 This post goes against my theme for the week, but come on, it's Tomato Tuesday! Only a vacation can stop me from doing a Tomato Tuesday post. We finally made it! Time to harvest tomatoes. Sorry if you are located anywhere else besides Seattle, and have been picking tomatoes for months (wait, I'm not sorry you lucky duck)! Pick tomatoes as soon as they ripen to allow the plant to focus on the remaining tomatoes. Remove yellowing leaves at the bottom of your plant to allow more sunlight to reach the fruit. If temperatures are consistently over 75 degrees in your region and your tomatoes seem to be staying orange (not transitioning to red), you will need to harvest! Once you bring them inside they will turn red. 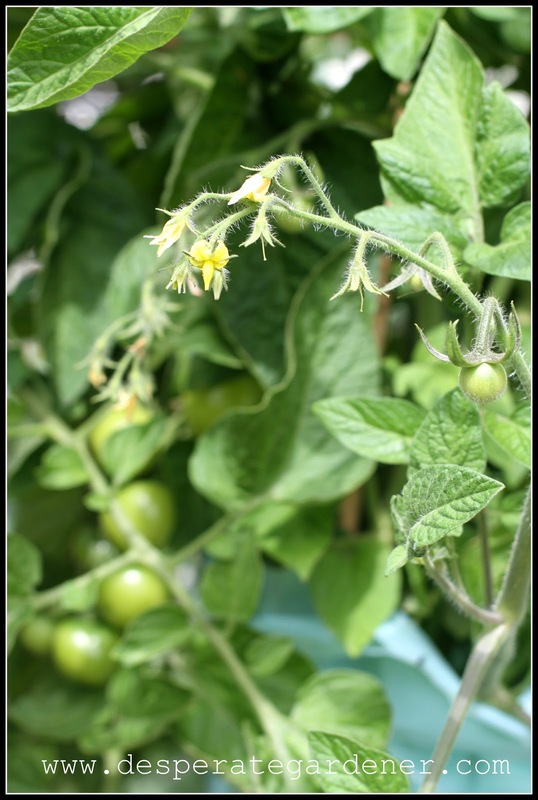 This is because at higher temperatures, the tomato will not make that final transition. I hope these don't all ripen at once! Feel the tomato, if it's slightly squishy, then it's time to harvest. 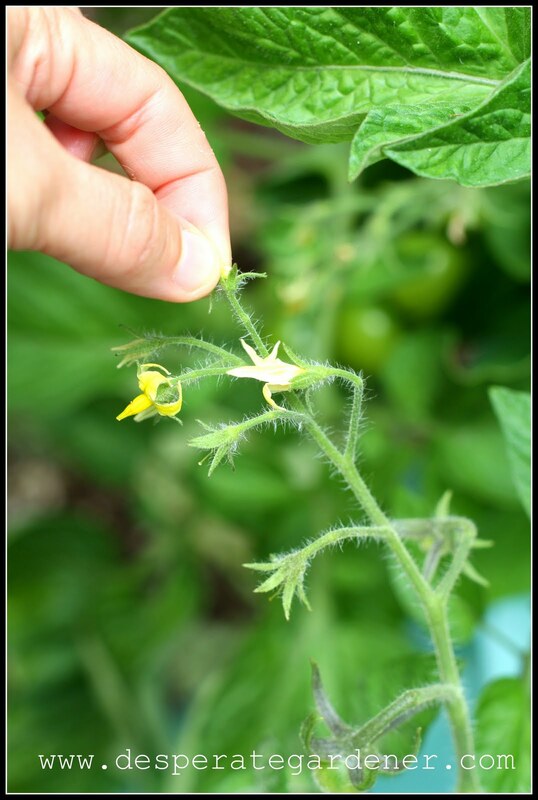 Once the tomato has "blushed" you can pick it and leave it inside to ripen (remember they need temperatures that are between 65-75 degrees to ripen). 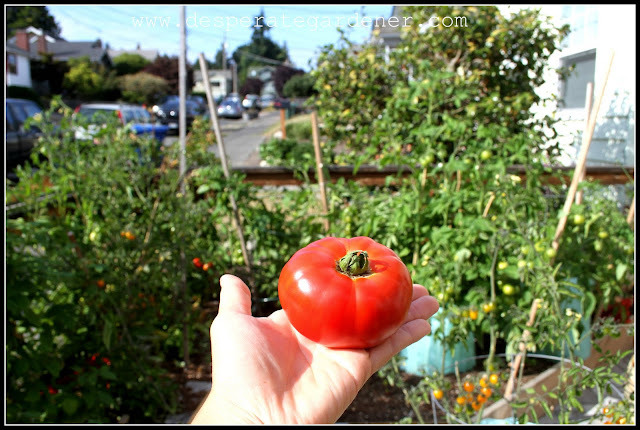 I personally think vine ripened tomatoes taste better, so the only reason you would do this is if there is a threat of frost, bugs, animals or neighbors. 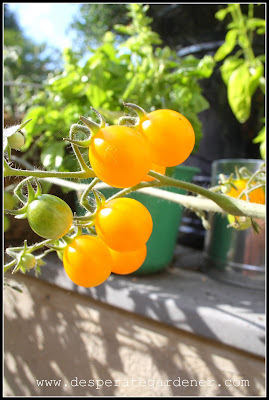 To pick a tomato, gently pull and twist the fruit from the vine. I'm giving these one more day, so close! My Rambling Red Stripe tomatoes! They are delicious! I wish I knew what kind of tomatoes these are. I purchased them 4 years ago and have been saving seeds year to year. I've tried purchasing seeds that looked similar, but they never are the same. 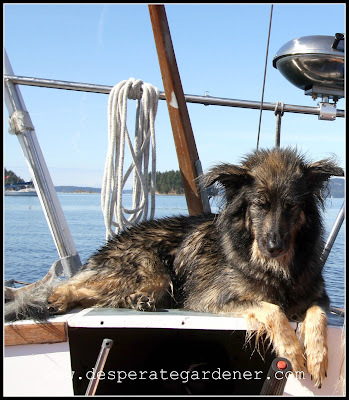 Prior to living in my current home, I spent many years in an apartment, in homes with no space for a garden, or just being too busy to maintain a garden. I wish someone had told me how easy it is to have a few simple pots that I could keep on a balcony and pay little attention to. For those of you that have an interest in starting a small garden, this is your week. 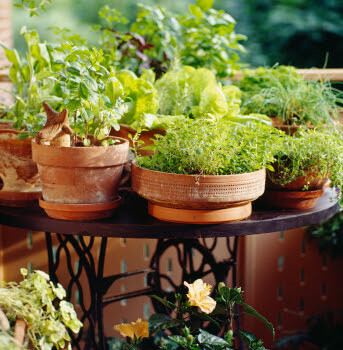 I'll be posting everyday this week about the basic steps to start a balcony garden. Your friends will be impressed when they come over for a dinner party and you zip out to pick some fresh lettuce, or maybe you whip up some cocktails with fresh herbs! Monday: Picking a location for your "garden" and what to look for in the containers that you use. Wednesday: Buying the right kind of dirt and starts. Thursday: Herb and vegetable combos. Friday: Caring for your new garden. You are going to be growing things that don't require too much sun, but try to place your pots so they are facing south or west. Choose a place that is sheltered from the wind. This can be tricky if you are in an apartment. You might think about placing a wind barrier. A small amount of wind is good, as it will help keep bugs off your plants. 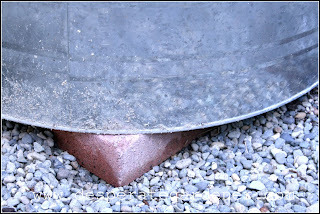 Make sure there are good drainage holes in the bottom of your container. 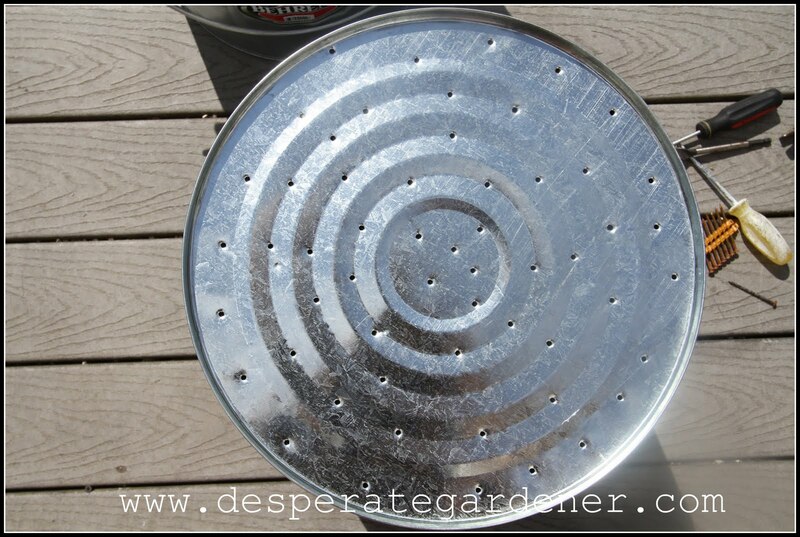 You may consider adding more holes as this is very important to the success of you garden! Prop up the pots on something so that water can easily escape through your drainage holes. You may have heard that adding gravel or other materials to the bottom of a pot increases drainage. It actually makes it worse. Sorry, I don't know why though! I had read a study that it does not work, and tried it myself and my plant did not do well. Cilantro is one of my favorite herbs. Maybe that is because my favorite food to cook is Mexican food. I add cilantro to just about everything, including my margaritas! Growing cilantro can be difficult because it goes to seed so quickly, especially when it's warm. 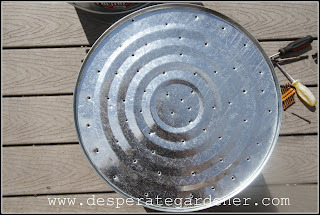 The best way to have continuous cilantro is to sow your seeds throughout the summer in 3 week increments. More than a few consecutive days of temperatures above 75 degrees will cause your cilantro to bolt. 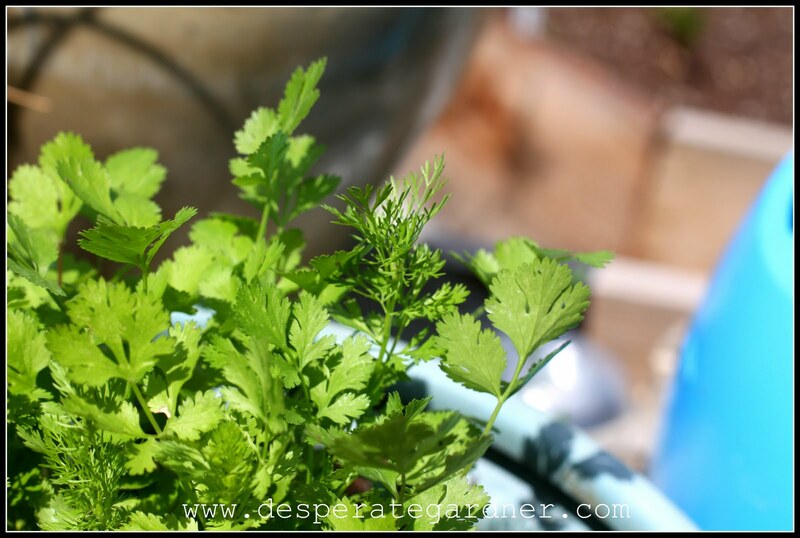 You can try and pinch off flowers, and harvest frequently to get a few more weeks out of your cilantro. Ultimately just give in and let it bolt and go to seed. Collect the seeds for cooking, they are called coriander. They have a citrus/sage like flavor that goes great with chicken and fish. And supposedly it's an aphrodisiac! You can also replant the seeds and grow more cilantro. 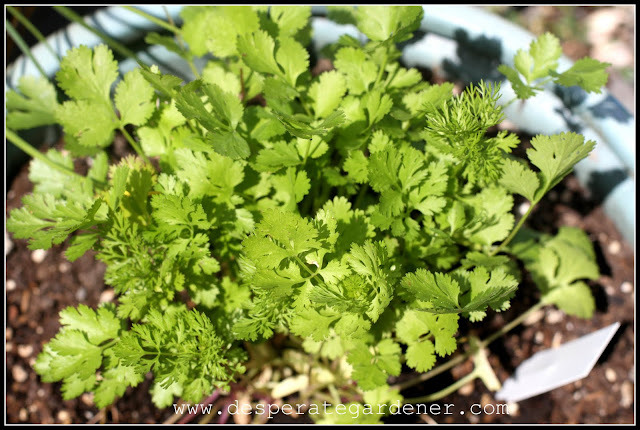 Cilantro does well with full sun in the morning and afternoon shade in the summer. Fall is a perfect time to grow cilantro due to the sunny days and cooler evenings. 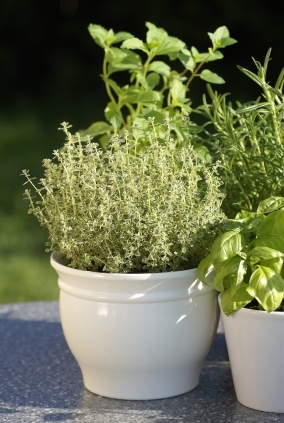 If you grow cilantro in a pot, make sure your pot is at least 12 inches deep to accommodate its deep roots. To harvest, wait until the plant is 6 inches tall and collect the outside leaves. Never take more than half of the plants leaves. Harvest with scissors to avoid tugging on the plant. Do not plan on transplanting your cilantro. It has very sensitive roots that if disturbed will damage your plant. Water your cilantro enough to keep it moist. It's important to water slowly and gently so you do not disrupt the roots. You can grow cilantro indoors! Place in a south facing window. See the fern-like leaves? That is what will bolt and create the flower. I'm back! I had a fabulous trip and I am excited to get blogging again! Mason had a good time too. On my way home, I stopped by my Grandma's house and she shared a tip on getting rid of fruit flies. I was shocked that she did not have one fruit fly in her home despite having fruit and vegetables on her counter. I don't know about you, but this time of year fruit flies are a common "guest" in every home I visit. Don't they drive you nuts? They have a short lifespan, however, the warmer the temperatures the longer the lifespan. They can live up to 30 days. They are attracted to fruit, vegetables, soda, alcohol, and rotting food. 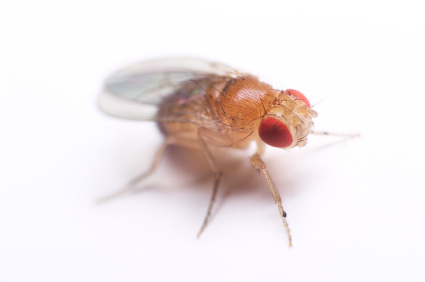 Fruit flies have incredible eyesight, allowing them to see in almost any direction at the same time. So don't waste your time trying to swat them. They are too fast. Place a half of an inch of vinegar in the bottom of the container. Red wine vinegar works the best as fruit flies are attracted to the smell of alcohol. Place a few pieces of cut up fruit in the vinegar. 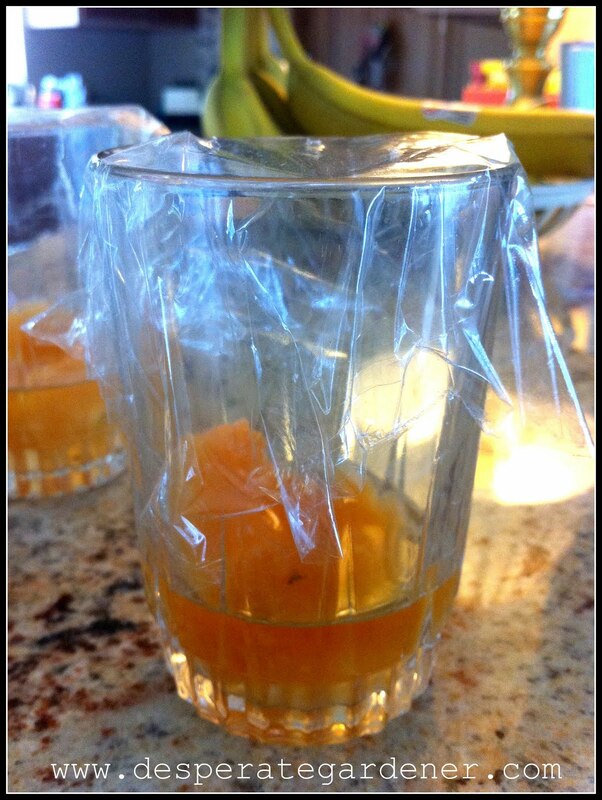 Place saran wrap over the top of your container. Poke several holes in the top of the saran wrap to allow the fruit flies into the container. I guess I'll be getting rid of my fly swatter! I'm hoping that's what you are wondering. Well, I am on an amazing vacation! I brought pictures with me so I could keep blogging, but I am having way too much fun. I am sailing in Canada with my husband eating fresh crab, swimming in beautiful inlets, and exploring funky towns. I went to a farmers market last night and thought I would share some of my photos. That's all the bloggin' you are going to get for now! 1. No tomatoes growing yet, only blossoms. 2. 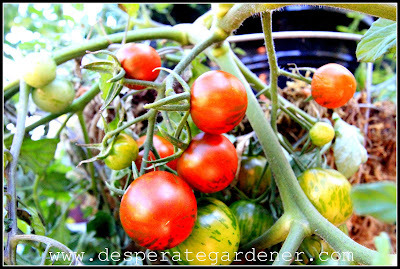 Ripening tomatoes, but there are a few weeks until they ripen. 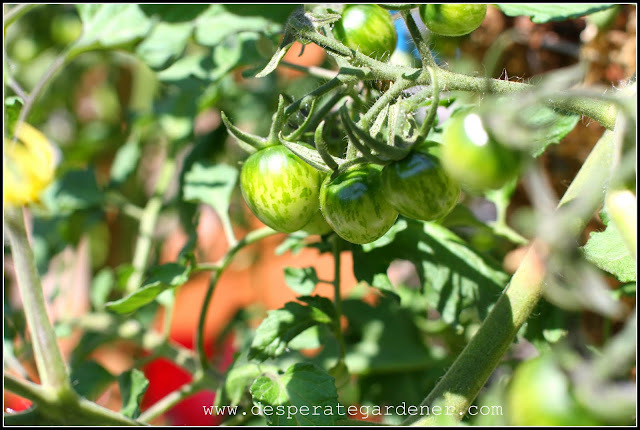 If you are number one you probably don't have tomatoes growing yet because you either planted too late, which is very easy to do in our short season climate, or your plants aren't receiving enough sun. There are other reasons for tomatoes not developing, but I'll need to save that for another post. For now, try adding some red plastic around the base of the plant to encourage your plant to grow. Oh shoot, that's another post too. I might have to make a Tomato Thursday. If you are number two (tomatoes ripening), which is where I am, you need to pick some of the blossoms off of your plant. 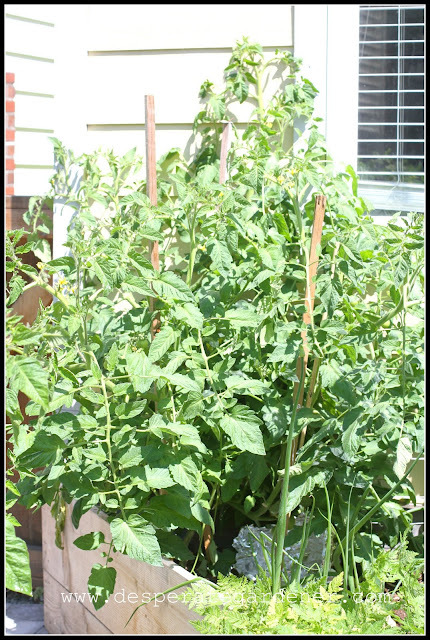 I have a large amount of tomatoes that I'm waiting to ripen on each of my plants. By picking off the blossoms that are on the plant, the energy and nutrients will be put towards the ripening tomatoes! You don't need to pick them all off, but at least three-fourths of them. Focus on the ones at the top of the plant since those most likely won't develop anyway. 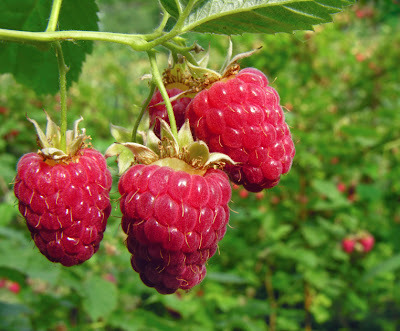 If you live in the Pacific Northwest and have room, you must grow raspberries. Talk about an easy thing to grow! 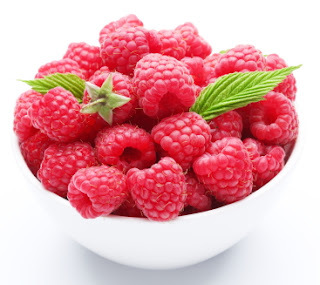 Raspberries love mild winters and cool summers. So yep, it's perfect here. Well drained soil is a must. Raspberries are prone to root rot. They are invasive, so plant them in a location that will allow for them to spread. Raspberry plants have suckers that will grow underground and can shoot up to 10 feet from the plant. You can dig a trench around the plant that is about a foot deep and place a wood or plastic barrier in the trench vertically. Your neighbors will thank you for doing this. I've read that they need full sun. 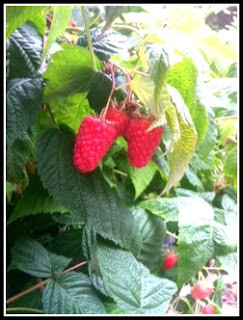 However, my mother has the biggest, sweetest raspberries I have ever seen and her plants are in a very shaded backyard. They receive maybe 2-4 hours of sun per day. Summer-Bearing: raspberries will ripen towards the end of the summer. Ever-Bearing: Raspberries will ripen in midsummer and again in early fall. Plant new canes. Don't expect fruit your first season. Make sure to cut your new canes to about 8 inches. Don't worry, I will remind you again in the Spring. 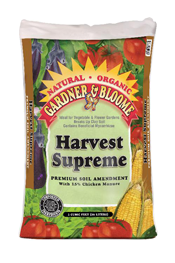 Apply a 5-10-10 fertilizer to established plants. Once you have harvested the last of your fruit (from second year canes), cut the canes you picked fruit from all the way down. This will allow the new canes that sprouted up over the summer to receive greater sun exposure. Once the leaves have dropped from your plant, cut the canes to 5 feet. This is on the new canes that sprouted up over the summer since you already cut the fruit bearing canes back in the fall. Eat yummy berries that you grew. It's a painful waiting game. My tomato plants have been in the stage where I think it's just going to be a few more days before they turn red, and here I am two weeks later still waiting! My rambling red stripe tomatoes. Tomato ripening is controlled by temperature. The ideal range is between 65-75 degrees. When ripening begins, the chlorophyll (green) begins to break down and the beta-carotene (orange) and lycopene (red) tints increase. I think I see some beta-carotene increasing! Too much heat or direct sunlight can cause your tomato to not turn red. So they may turn slightly pink, but are squishy when you cut them open. 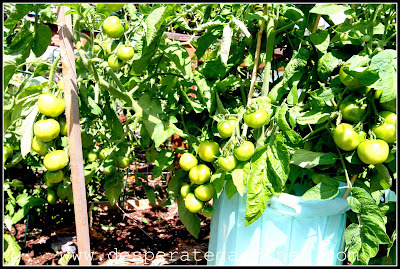 Lack of sun (or heat is the main issue) will keep your tomatoes green. My solution for you? Aluminum foil. 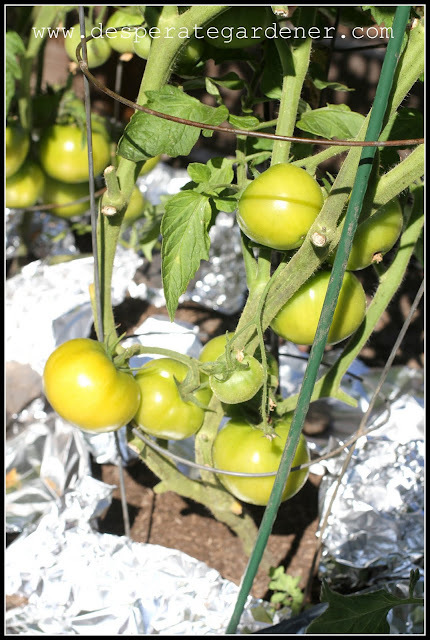 If it is consistently above 75-80 degrees where you live, try placing some aluminum foil over the top of the fruit to reflect the heat off of the tomato. If the temperature in your area is cooler, place aluminum foil under the fruit to reflect the heat up. This is just one plant! There are tomatoes growing underneath that I'm concerned aren't receiving enough heat. I have placed foil underneath them to reflect the heat from the sun. 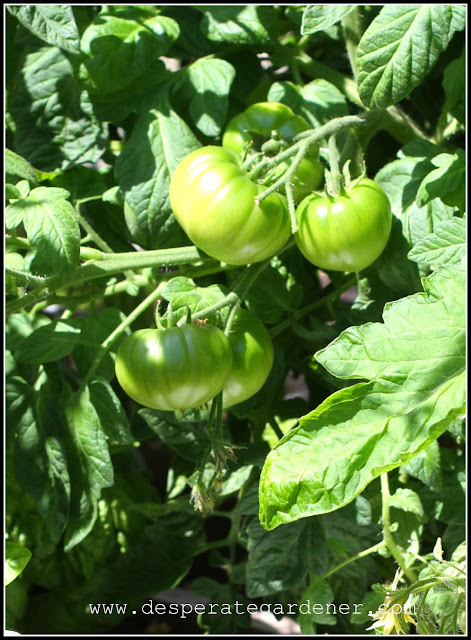 A common misconception is that sun is what ripens tomatoes, when heat is actually the most important factor. I want to wish my Grandma a very happy 87th birthday today!